Nothing says “WOW” like some green that isn’t green. So where do those amazing bud colors come from? Cannabis strains, long before cannabinoid testing, could only be measured with the senses. How did it smell & taste? Bag appeal came from the bud trim and aromas, sure. But what really blows us away every time is color. 93% of shoppers make purchasing decisions based on color and visual appeal. And nothing says “WOW” like some green that isn’t green. So where do those amazing bud colors come from? Some strains of cannabis change color as they flower. What’s the secret? Genetics. 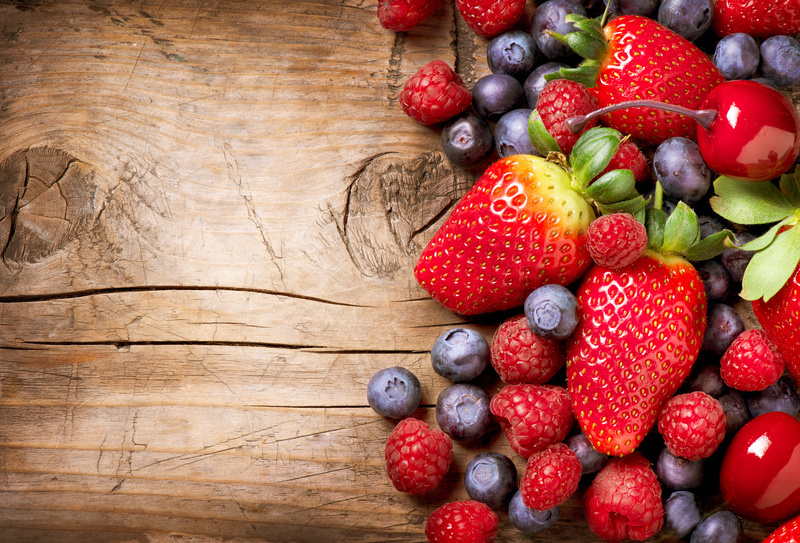 Anthocyanins are a group of around 400 water-soluble pigment molecules classified as flavonoids. They appear red, blue, or purple according to their pH. Interestingly, flavonoids are generally yellow, hence the latin root “flavus“, meaning yellow. They also have nothing to do with flavor, being extremely bitter. Think of the tree leaves in fall. As temperatures drop, they change from green to red, orange, yellow, or gold. Cannabis doesn’t produce the colors until the latter half of the flowering stage, with a few exceptions. Once the green fades, they can come forth and shine. Temperature plays a vital role, as cooler temperatures inhibit chlorophyll production. Chlorophyll, you might remember from 6th-grade science, is the plant component vital to photosynthesis. For cannabis, depending on the lineage of the strain, certain other colors will appear when you drop the temp and the light cycle shortens, mimicking the change in season. The ideal range to grow cannabis is a pH of 5.5-6.5. But during flowering, you can lean one way or another to enhance or minimize certain anthocyanins, bringing out certain colors. The many strains of cannabis come with different cannabinoid ratios, flavor profiles, and anthocyanins. 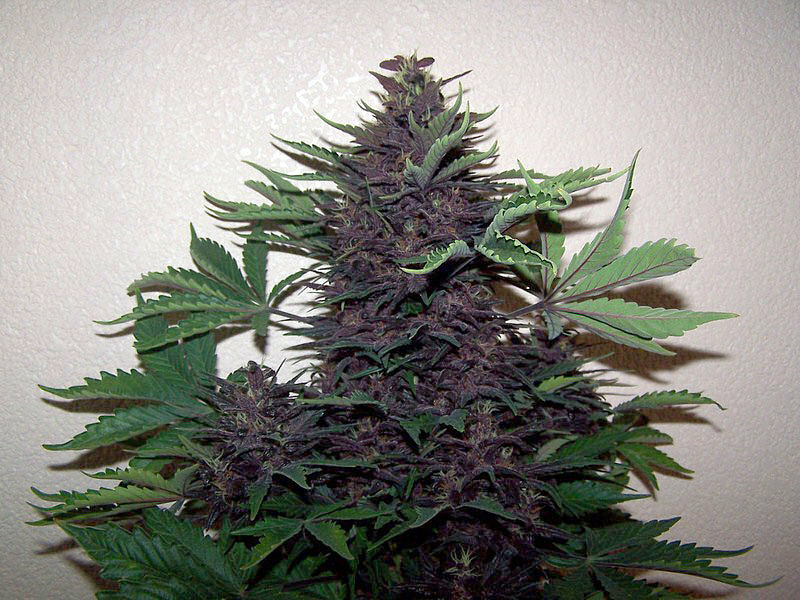 The most prominent variation to green cannabis is purple. Strains like Purple Urkle, Grandaddy Purple, and many others easily produce that pigment. Certain strains have so much that you don’t even need to drop temperatures to see the change, as the plant naturally starts to lose chlorophyll at the end of its life. Purple Orangutan has some of the strongest blue and purple hues in the world. Purple hues come to the fore in more neutral pH environments. Blues also enjoy higher pH levels than most cannabis strains. Red hairs show up more frequently today, but actually red buds and leaves are not nearly as common. 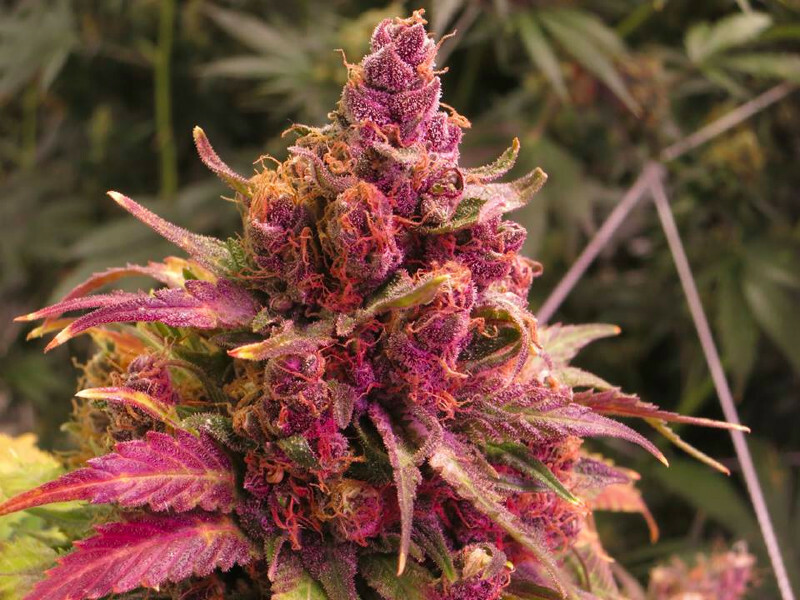 For truly ruby herb, some strains that carry dominant red tones such as Pink Flower Shaman, pictured above, you will have to do some searching. Predator Pink expresses some phenotypes with actual pink and fuchsia hues. Don’t go buying every strain with red or pink in the name, however. Most of the time, this refers either to the hairs or flavor accents, like pink lemonade or grapefruit. You can also cheat a little changing plant leaves and buds a bit red by manipulating nutrients. Phosphorus deficiencies can cause this, but it won’t be as pretty as the real thing. Carotenoids give cannabis those citrusy hues of yellow, gold, and orange. To get these colors, you want more alkaline conditions. If these colors are predominant in the plant, they will naturally come out as the flowering phase comes to an end and chlorophyll starts to fade. Orange will mostly affect the hairs and buds, such as Olive Oyl, Kandy Skunk, and some phenos of Alien OG. Yellow strains include Wicked OG, Grapefruit, and Lemon Kush, of course, which all taste great in the PAX 3. There are some rare strains that turn so dark that they appear black. The origin of these genetics goes back to Vietnamese landraces, I.E. Vietnamese Black. All other strains derived from hybrids, such as Black Willy and Black Tuna, share both the signature ebony buds and leaves. In addition, black strains are noted for their intense psychedelic, cerebral highs. If you want visuals, this lineage is a surefire hit. The inky appearance comes from an overabundance of all colors in the leaves. With warmer temperatures, the dark reds and purples get replaced with lighter reds and golds in some cases. Anthocyanins can be present in the vacuoles of the cells in plant tissues, leaves, and flowers. Sometimes, they even present in the trichomes themselves. They also act to attract pollinating creatures like butterflies and bees, while deterring pests that might snack on them or lay their eggs by tricking them to think the plant is unhealthy. Besides pH and temperature, using LED lights with specific spectrums can enhance the production of anthocyanins in the tissues of cannabis. They serve as “sunscreen” for plants, so stressing them with more UV light can make the plant produce more, enhancing the color. A common misconception is that strains with bold color are more potent. The truth is that color has nothing to do with potency, just bag appeal. However, anthocyanins are known to act as powerful antioxidants and are also thought to have analgesic, anti-inflammatory, and neuroprotective properties. Research suggests that some anthocyanins have a selective affinity for either CB1 or CB2 receptors, depending on the type. So while the presence of anthocyanins doesn’t change the potency of cannabinoids like THC, it might give the strain an added entourage effect on health. Other plants high in these molecules include blackberries, blueberries, raspberries, goji berries, blood oranges, and cranberries. Cranberries especially are touted for their powerful antioxidant properties, due to anthocyanins. 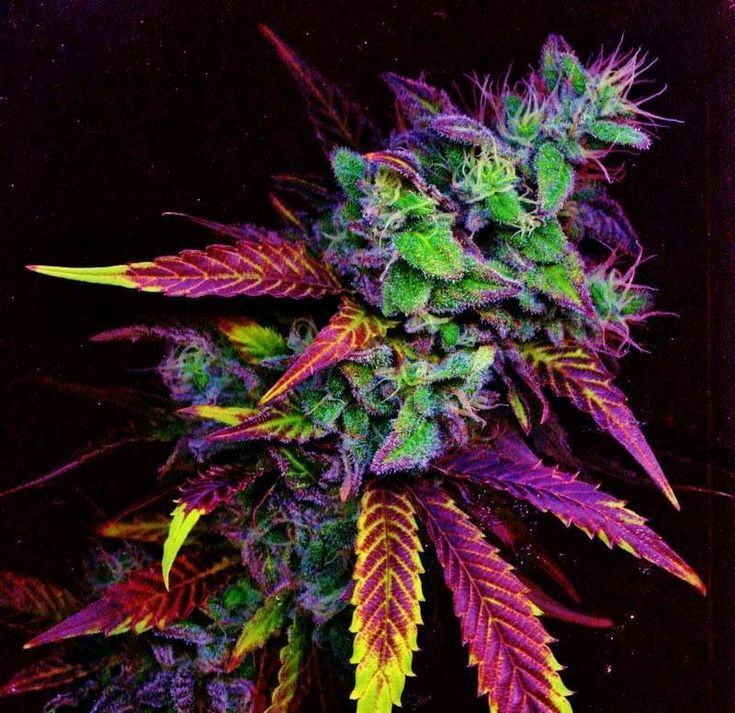 Does cannabis with vibrant colors draw you irresistibly? What is the wildest strain you have tried? Tell us on social media or in the comments below.